In what is surely a brilliant bit of counter-insurgency marketing, OR Books will be releasing the political antidote to Sarah Palin's memoir Going Rogue with Going Rouge--Sarah Palin, An American Nightmare, on November 16, the day before Palin's tome explodes on the national book market. Although it's been billed by some right-wing commentators as a "copycat publication" intended to "confuse readers," Going Rouge will not be appearing in bookstores and will be available only on the OR website. 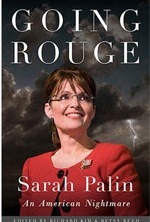 Edited by Richard Kim and Betsy Reed of The Nation, Going Rouge contains a superb collection of more than 50 short articles on Palin by an all-star array of political writers who skewered Palin during her vice-presidential candidacy last fall. Many of the classic pieces written about Palin in the last year are collected in the volume--including "Wrong Woman, Wrong Message," by Gloria Steinem, and "Our Polar Bears, Ourselves," by Mark Hertsgaard. Going Rouge is an engaging read from start to finish. In their introduction, Kim and Reed rightfully acknowledge the "vital place" that Palin currently occupies "in the Republican Party's zeitgeist." In spite of her loss last fall on the Republican ticket and her endless series of car crashes on the campaign trail, Palin remains in the words of New York Times columnist Frank Rich not only the GOP's "biggest star and most charismatic television performer; she is its only star and charismatic performer." No one was talking this past week about paying Mitt Romney or Mike Huckabee $100,000 to come to Iowa. If you've followed Palin's career closely, as I have, most of the essays here will be familiar, though I somehow managed to miss Robert Reich's powerful excoriation of Palin's "death panel" hysteria in response to Obama's proposed health-care reforms. One of the reasons that Palin was selected as John McCain's running mate, of course, was as a calculated attempt by his campaign to wrest women voters (read Hillary Clinton supporters) away from the Democratic Party ticket. In the end it proved to be a strategy as ridiculous as it was misguided. Perhaps the most compelling sections in Going Rouge are those that address feminist considerations magnified (and distorted) by Palin's candidacy. It includes splendid pieces by the likes of Steinem, Katha Pollitt, Jessica Valenti, Amy Alexander, Linda Hirshman, Amanda Fortini, Rebecca Traister, Michelle Goldberg, Emily Bazelon and Dahlia Lithwick--all of whom shed considerable light on the varied and complex nuances of gender and feminist constructions raised by the Palin phenomenon. Traister, a contributor to Salon who has a book coming out next fall about women in the 2008 campaign entitled Big Girls Don't Cry, was by far the best--and most consistent--feminist critic of Palin throughout the campaign. In "The Sarah Palin Pity Party," Traister writes, "I guess I'm one cold dame, because while Palin provokes many unpleasant emotions in me, I just can't seem to summon pity, affection or remorse." Max Blumenthal, author of the fascinating Republican Gomorrah, is also here in all his splendor, with an account of Palin's witch-hunting pastor from Kenya, Thomas Muthee, "who urges his parishioners to crush 'the python spirit' of the unbeliever enemies by stomping on their necks." While two of Alaska's best known bloggers (and HuffPo contributors) Jeanne Devon (AKMuckraker) and Shannyn Moore are included in the collection (Devon thoughtfully explains the brutal ironies of Palin using the term "rogue" in the title of her book), the Last Frontier gets more than a bit short shrifted in Going Rouge, and that's too bad. There's little mention of Palin's role as a council member and mayor of Wasilla, her brutal firing of Police Chief Irl Stambaugh and her betrayal of political allies from the early days of her career. I also would have liked to have seen some excerpts from the Branchflower Report included in the collection along with a run-down of the nearly 20 ethics complaints that are tidily posted on the pages of the Anchorage Daily News. While Palin is now an American icon, she is also very much a product of longstanding Alaskan political traditions of isolation and corruption, and her current political traction remains linked to the interplay between those forces. Then, too, are Palin's strange post-election relationships with the likes of Greta Van Susteren, John Coales and Fred Malek--all of whom go unmentioned in the collection. But these are minor rubs. One thing is certain: You will read far more about the real Sarah Palin in Going Rouge than you ever will in her own memoirs, being published by (who else?) Rupert Murdoch. If there is a single consistency in the Palin canon it is that she is an inveterate liar and motivated by a reckless ambition that has left a trail of collateral damage from Wasilla to Washington, D.C. Going Rouge is full of golden nuggets about Sarah Palin. Judging from her past performances, her own book will most certainly be riddled with deceit. $16 paperback; $10 e-book; 336 pp. Award-winning writer and filmmaker Geoffrey Dunn's book The Lies of Sarah Palin: The Untold Story Behind Her Relentless Quest for Power will be released by St. Martin's Press in spring 2010.